A recent study has shown that new car buyers who follow four simple steps can save $800, or even more, on their new car purchase! The internet has forever changed how people buy cars and a team of researchers from UC-Riverside, Yale, and Northwestern conducted a study to find out exactly how using the internet and negotiation helped consumers as they shopped for new cars. At the conclusion of their research they listed four things that every new car buyer should do to get a great deal! We'll walk you through each of those steps and show you how you can do all of them right here at NewCars.com. Remember — you don't have to do all of these steps, but the more of them you do, the more money you'll save! This is a good place to start. Even if you don't know exactly which vehicle you want we offer a useful tool known as Car Chooser, which allows you to compare different models or offers some of our own favorites in categories like Practical Cars, Fuel Efficient Sedans, or Hybrids. 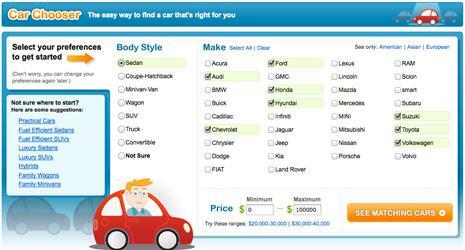 You can sort by make, price, body style, even region or origin (American, Asian, or European). This is a great place to start to not only get an idea of what you want, but to compare prices and features as well. This is also known as the "invoice price" and indicates how much the dealer paid to the manufacturer for the vehicle. If you know this price, then you'll know exactly how much the dealer has marked the car up. Here at NewCars.com, we list not only the MSRP (retail price) of the car but also its invoice price so you have more leverage. In the past, this meant driving from dealer to dealer, and speaking to salesman after salesman — but no more! You can now do this from the comfort of your own home and in a fraction of the time. We offer a tool on our site called New Car Locator which can help with this. Simply input your zip code and choose the vehicle you're looking for (even down to the color and engine options), then New Car Locator will hunt around and provide you a list of dealers in your area with that specific model on their lots! Even better than that, we allow you to pick up a free internet price quote from up to three dealers at a time. Want more selection? 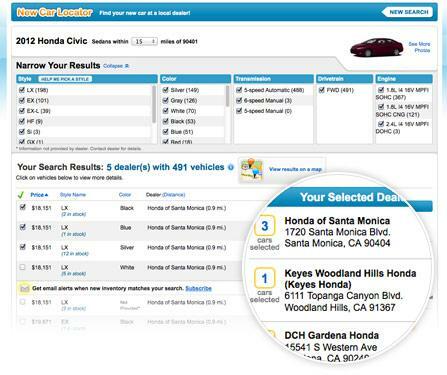 Expand the search radius and get even more dealers competing for your business. The study indicated that consumers who shop at two dealerships will save on average $109, but those who shopped at as many as seven dealerships saved about $600! Negotiating used to mean sitting across the desk from a salesman, haggling back and forth. But no longer! After you submit your information asking for a quote, the dealership will get in touch with you, usually within 24-48 hours after your submission. And most dealerships now have Internet Sales Managers, who specialize in dealing with customers who connect to the dealer via the internet, so you can compare offers and prices from multiple dealerships all from the comfort of your own home. Once you've narrowed down the offers to the ones you like, you can start to think about visiting dealerships. 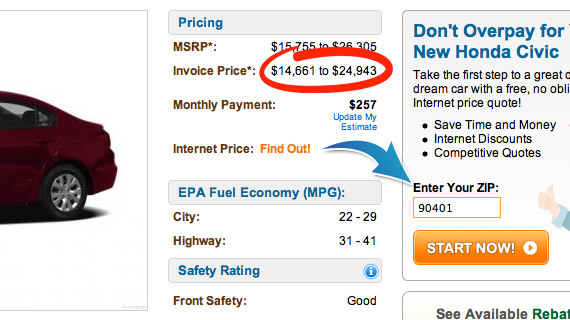 Our free quote system makes it easy for you to get offers from multiple dealerships and compare them. And remember when you're negotiating that customers who were willing to have multiple rounds of negotiations saved an average of $300! Keep these tips in mind and you'll be sure to get a great deal on your new set of wheels! We'd also encourage consumers to visit our Rebate Center, to see if there are any current rebates, incentives, or special lease offers available for models in their area. If you have any further questions about the car buying process, be sure to check out our extensive How-To Section, or ask us a question directly on Facebook or on Twitter (@NewCarscom).